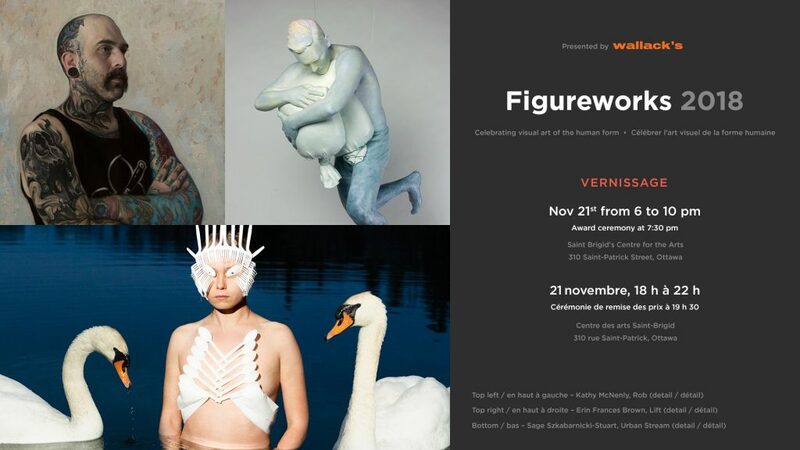 Figureworks is an international annual juried art prize and celebration of the art of the human form held in Canada’s capital, Ottawa. We believe in being inclusive and accept figurative works in all media from all over Canada and Internationally. Our condition, the work must have a focus on the human form. Every year we strive to have the best possible jury; one that is balanced in their views and experience, varied in their media, masters of their craft and great storytellers. We hold the Figureworks exhibition at St. Brigid’s Centre for the Arts, a historic church transformed into a beautiful exhibition space right in the heart of Ottawa’s beautiful Byward Market. Joanne Rycaj Guillemette has worked both in the Private and Public sectors as well as not-for-profit arts and cultural organisations providing administrative and strategic support, guidance, and artistic direction. She has worked in photo conservation for Library and Archives Canada (LAC), most recently as Curator and Photo Archivist providing curatorial and project management services for exhibitions with national partners as well as negotiating acquisitions and managing historical research of collections. Joanne is currently responsible for the Indigenous Portfolio in Private Archives acquisitions for LAC and is a Board Director for the School of Photographic Arts: Ottawa and a member of its Exhibitions and Gallery Committee. She was a steward of the Steering Committee for the Ottawa 2017 Arts, Culture and Heritage Investment Program, and continues to support the Ottawa Arts Council as the Chair of the Arts Awards. Her experience in the field of photography includes her own artistic practice. Jennifer Macklem is a multi disciplinary artist who creates sculpture, video, performances, installations, paintings, drawings and collaborative public art. With a national and international exhibition record, her artistic practice is experimental in nature. She completed her undergrad studies at the Ecole Nationale Supérieure des Beaux Arts in Paris and at the Parsons School of Design and earned an MFA at the Université du Quebec à Montreal. She has presented her work nationally and internationally at artist-run centers, university galleries and museums. In her work you find birds in the afterlife, ears of butterflies, iridescent wings, pools of black ink, pig heads in bronze, frozen landscapes, portraits, mink fur, imaginary planets and narcissistic goats. Reviews of her work have been published in the Journal of Canadian Art History, Vie des Arts, Espace, Guerilla Art, Front: Etcetera and Le Devoir, Montreal. Jennifer Macklem is an Associate Professor in the Department of Visual Arts at the University of Ottawa. Danuta Sierhuis, M.A., is the Curatorial Assistant, Canadian Art at the National Gallery of Canada. She recently contributed extensive research, writing and administrative support towards the development and reinstallation of the permanent collections exhibition, Canadian and Indigenous Art: From Time Immemorial to 1967 (2017) and Canadian and Indigenous Art: From 1968 to Present (2017-2018). She also co-curated RBC Canadian Painting Competition(2017) alongside Rhiannon Vogl, Associate Curator of Contemporary Art last fall. Before arriving at the National Gallery of Canada in 2016, Danuta held curatorial and administrative roles at Studio Sixty Six, Carleton University’s Archives and Research Collections, and Carleton University Art Gallery in Ottawa. Her interest in Canadian Art spans feminist art history, historiography, and digital humanities. In her spare time, she is a practicing fibre artist, creating woven wall hangings and punchneedle pieces that emphasize texture and colour. KIMBERLY CALLAS – ALL RIGHTS RESERVED Website by Bonneville Consulting, LLC.